At the Molosser Olympics Show in New York, some of our younger Caucasians went under the experienced eyes of international FCI Judges. The results were outstanding. Here you will find some of the awards and honors won by the Esquire Caucasians. We will be updating the account both for new accomplishments and as we digitize our older records. We have also added links to the actual written Evaluations given to our dogs by the expert judges who have examined them, for those who are interested. These are given in full, just as we received them. 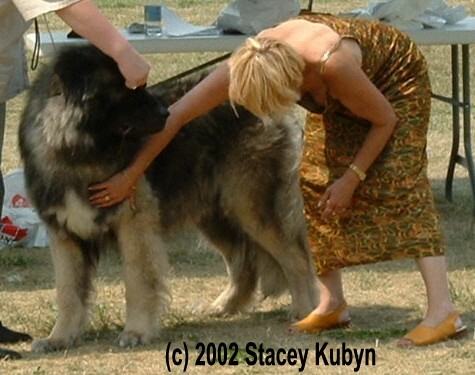 September 2003 - DRAKO rated FCI "Very Promising"
Our young DRAKO Esquire, son of our USSR Multi Ch. FARAON KS-1, was rated "Very Promising" - the highest rating for a juvenile - under all four FCI judges present at the MolosserStock Show in New York. Critique comments were unanimous: Correct type, sound structure, good movement, correct bite and excellent temperament. Don Pascual Asensi - FCI Judge (RSCE - Spain), President - Molosser Club of Spain, President - Alicante Kennel Club. Rafael de Santiago - FCI Judge (FCPR - Puerto Rico), Treasurer - Federation Cynologique Internationale (FCI), President - Federacion Canofila de Puerto Rico. Roberto Velez Pico - FCI Judge (FCPR - Puerto Rico), Member - FCI Judge Commission and Expositions. Luis Ortiz - Pending FCI Judge, President - Dogo Canario Club of America, President - Spanish Water Dog Club of America. At the MolosserStock Show in New York, Ch. FROL GVIDONOVICH iz Svetlogo Doma, Russkiy Medved ONEGA and a real handful of precious FARAON puppies (sire USSR Multi Ch. FARAON KS-1 with dam Russkiy Medved LADOGA, born here at Esquire) went under the experienced eye of an FCI Judge-Expert from Russia. The results were outstanding. Please click here for the written Evaluations by Judge-Expert Polivanov. Click here for a special Photo Gallery dedicated to the FARAON x LADOGA puppies. August 2002 - FROL and LEYLA rated FCI "Excellent"
At the Rarebreed Club of Southwest Ontario Canada dogshow, held in conjunction with the Canadian Kennel Club, both FROL GVIDONOVICH iz Svetlogo Doma and his favorite girl, our LEYLA Hunza, both received ratings of "Excellent" from the FCI judge. Mde. Christaine Lafay - FCI Juge quallifié et formateur expo (France), President - Club français du St-Bernard, President - Club français du dogue du Tibet. Click here for the written Evaluation of FROL by Mde. Juge Lafay. Click here for a special Photo Gallery of FROL at various events. Also, you might want to check out the FROL Fan Club and the adventures of "his girl" LEYLA at Leyla World. May 2002 - FROL rated FCI "Excellent" and wins "Best-Of-Breed"
At the American Rare Breed Association (ARBA) Cherry Blossom Classic in Washington D.C., FROL received an "Excellent" and won "Best-Of-Breed" against competition. Zoran Brankovic - Senior FCI Judge (Serbia and Montenegro), RKF Specialist - Kavkazskaya Ovcharka. 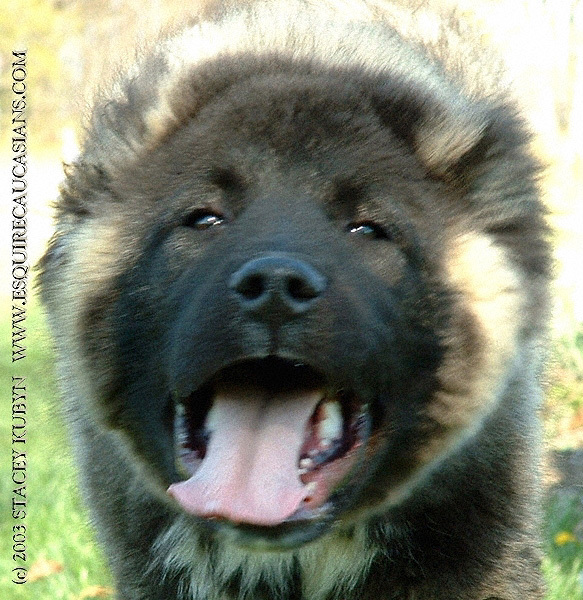 Our CEZAR is certified Temperament Tested by the Eastern Rarebreed Dog Club. Congratulations to you and your dogs, Ch. Esquire's Bruno and Hurma of Illinka Esquire. 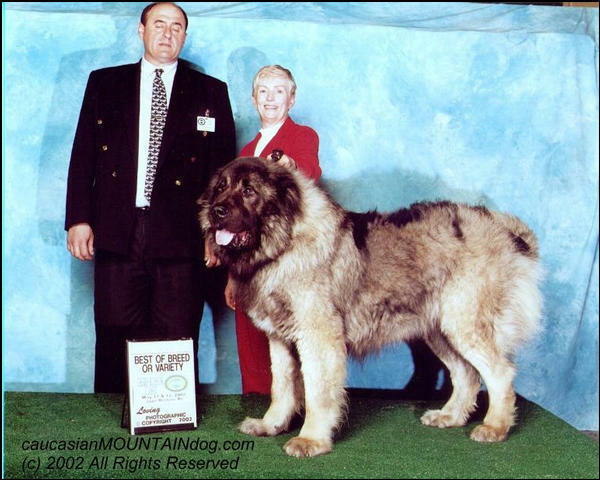 According to ATTS records, your dogs are the first two Caucasian Ovcharka to have earned the "TT" Temperament Title. Your dogs earned this title in East Rochester OH on May 1, 1999 - and have been recorded as TT-1-COV and TT-2-COV respectively. The Temperament Title speaks well for your dogs and for your breed. Please inform us if you have a breed publication which we should notify of your dogs' achievement. I handled the dogs and all-in-all the testing was a breeze and the dogs were perfect citizens during the 5 hour wait with the other dogs and people. Both Bruno and Hema scored very well in Protection, and stood their ground and investigated the gunshots. In usual style, Hema investigated the umbrella prop by going around it and investigating the station worker holding it!" We are so very proud of "Hema" and her son ! Click here for more information on the Delta Society and Therapy Dogs. Making breed history, Ch. CEZAR won TWO Best-In-Shows at the American Rare Breed Association (ARBA) Cherry Blossom Classic weekend in Washington D.C., the largest allbreed rarebreed show in the United States. He also took home the ARBA Memorial Award for the most dogs defeated. Click here for a special Photo Gallery dedicated to our Ch. CEZAR.